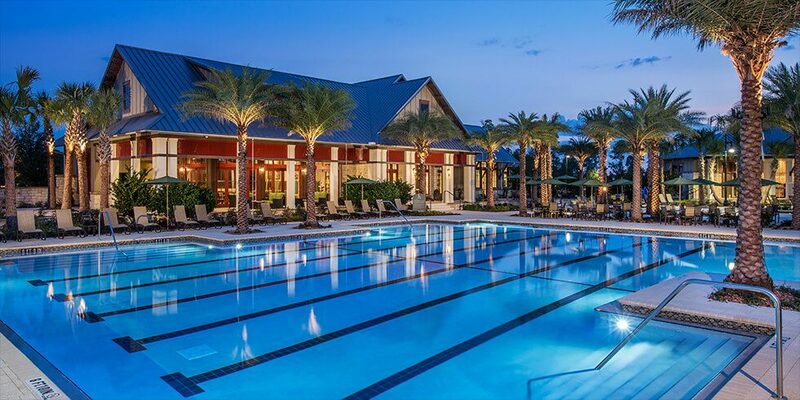 Shearwater, Freehold Communities’ new master-planned community in St. Johns County, was recently honored with five prestigious design and construction awards. Featured on the Florida Times-Union, the Ponte Vedra Recorder and What’s Up Jacksonville, these awards celebrate Shearwater’s meticulously designed community, which has become one of the fastest-growing developments in the area. Shearwater was awarded four Aurora Awards, a recognition presented annually by the FHBA and the SEBC to recognize excellence in planning, design and construction projects across the Southeastern United States and Eastern Caribbean. Shearwater’s overall design brought home two awards in the Residential Housing Community of the Year category and for Best Community Site Plan. The Kayak Club received two additional awards for Best Recreational Facility and Best Interior Merchandising-Community Amenity or Clubhouse. ELM designed the Kayak Club to act as the heart of the community, providing areas both indoor and out for residents to meet up and enjoy Shearwater’s resort-style amenities and community events. “This recreational and community hub was designed to offer residents a high-quality social, aquatics, fitness, play, and tennis experience. It is linked through a network of trails and open spaces to parks integrated throughout the community, offering tot-lots, picnic areas, dog parks, creek front overlooks, and a kayak and canoe launch on Trout Creek,” said Steve Lovett, ELM Principal and lead designer for Shearwater. As for the interior of the Kayak Club, Ansana created a unique feel by combining luxurious features with the comfort of home, and giving it all a Florida flare. “The Kayak Club’s interior design concept was inspired by the area’s natural environment along Trout Creek combined with Old Florida architectural elements,” said Nancy Short, Design Principal at Ansana Interior Design. Comfortable lounge areas, outdoor seating and the HUB Wi-Fi Café were purposely designed to encourage residents to utilize the building and spend time together. In addition to four Aurora Awards, Shearwater was also awarded the 2017 Excellence in Construction Eagle Award by ABC’s First Coast Florida Chapter. This award recognizes outstanding contractors for the highest quality construction projects. Shearwater received this industry-leading recognition for the Kayak Club’s striking entryways and beautifully designed hardscapes. To experience Shearwater and its award-winning Kayak Club for yourself, stop by for a tour any day of the week! The amenities information center is open Monday through Saturday from 10am to 6pm, and Sunday from noon to 5pm. In the meantime, join our Interest List to receive news and updates on this one-of-a-kind community.